32 hectares with more than 7 million tulips, daffodils and hyacinths. 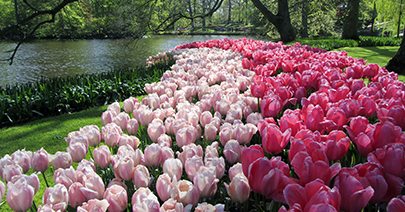 Every year, Keukenhof creates a complete new look according to a central theme. Everywhere you look are tulips and other flowers. Though the park is only opened 8 weeks a year it attracts around 800.000 visitors each year. Keukenhof is unique in the world and an unforgettable experiences for people of all ages, it is without a doubt the best place to see tulips in Holland. With our luxury taxi transportation services we make your trip to the Keukenhof Gardens extra pleasant and comfortable. 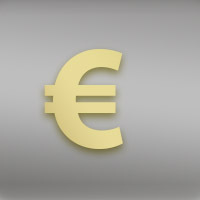 If required we can provide you with a local tour guide who speak fluent Russian, Spanish, German, French, Portuguese or English. 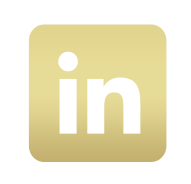 Please contact us for a quotation according to your wishes. Kinderdijk is a village in the Netherlands and is the only place in the world with so many windmills so close together in an authentic polder landscape. 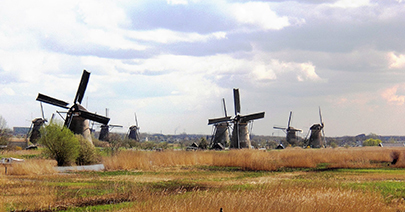 To drain the polder, a system of 19 windmills was built around 1740. In Kinderdijk, the almost one thousand years of 'battling the water' is still visible in the polder landscape. It’s with good reason, that the Kinderdijk-Elshout windmill complex was added to the UNESCO World Heritage list in 1997. The windmills of Kinderdijk are one of the best-known Dutch tourist sites and a typical Dutch, world-class landscape with delightful views, overwhelming cloud formations and stunning nature. 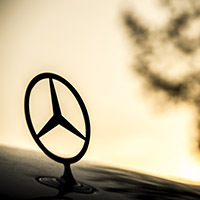 With our luxury taxi transportation services we make your trip to Kinderdijk extra pleasant and comfortable. If required we can provide you with a local tour guide who speak fluent Russian, Spanish, German, French, Portuguese or English. Please contact us for a quotation according to your wishes. 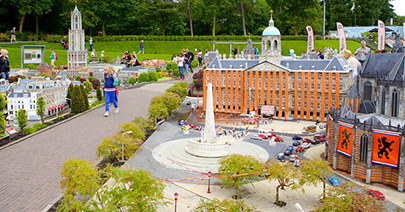 Madurodam is a miniature park and tourist attraction in The Hague and is the home to a range of 1:25 scale model replicas of famous Dutch landmarks, historical cities and large developments. With our luxury taxi transportation services we make your trip to Madurodam extra pleasant and comfortable. If required we can provide you with a local tour guide who speak fluent Russian, Spanish, German, French, Portuguese or English. Please contact us for a quotation according to your wishes. Volendam is a town in North Holland, 20 kilometres north of Amsterdam and offers many Dutch clichés such as costumes, wooden shoes and of course fish. 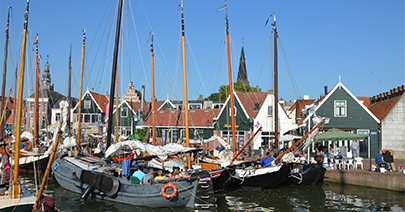 Sometimes called "the pearl of the Zuiderzee", this place is a highly popular tourist destination. With our luxury taxi transportation services we make your trip to Volendam extra pleasant and comfortable. If required we can provide you with a local tour guide who speak fluent Russian, Spanish, German, French, Portuguese or English. Please contact us for a quotation according to your wishes. 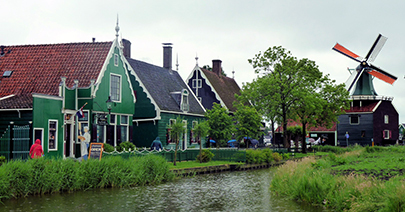 Zaanse Schans is like an open-air museum, but in reality the Zaanse Schans is a residential area in which the 18th and 19th centuries are brought to life. Visit the bakery museum and enjoy the smell of fresh bread, or take a look at the warehouse where clogs are made. The Zaanse Schans is a unique part of Holland, full of wooden houses and working windmills. A day out at the Zaanse Schans in North Holland is fun and educational. With our luxury taxi transportation services we make your trip to Zaanse Schans extra pleasant and comfortable. If required we can provide you with a local tour guide who speak fluent Russian, Spanish, German, French, Portuguese or English. 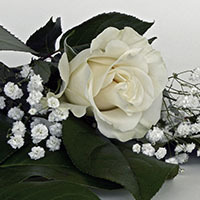 Please contact us for a quotation according to your wishes. Amsterdam is the most visited and largest city of the Netherlands. During the construction of the Metro "Noord-Zuid lijn" archeologists discovered, some 30 meters below street level, pole-axes, a stone hammer and some pottery, all dating from the Neolithic era (New Stone Age). This would mean Amsterdam or its predecessor would have seen human habitation since about 2600 BCE and that the origins of Amsterdam are much older than 'only' the twelfth century. What makes Amsterdam so attractive are the main attractions such as its historic canals, its red light district, its many coffee shops and also the Rijksmuseum, de Van Gogh Museum and Anne Frank House. The friendly and relaxed environment draw more than 5 million tourists annually.